In 1859 the Reverend James Marshall, a teacher, a Methodist minister (pastor of the church there and also a medical doctor) established a school about 500 yards south of the present day Cottage Hill Church and Cemetery. 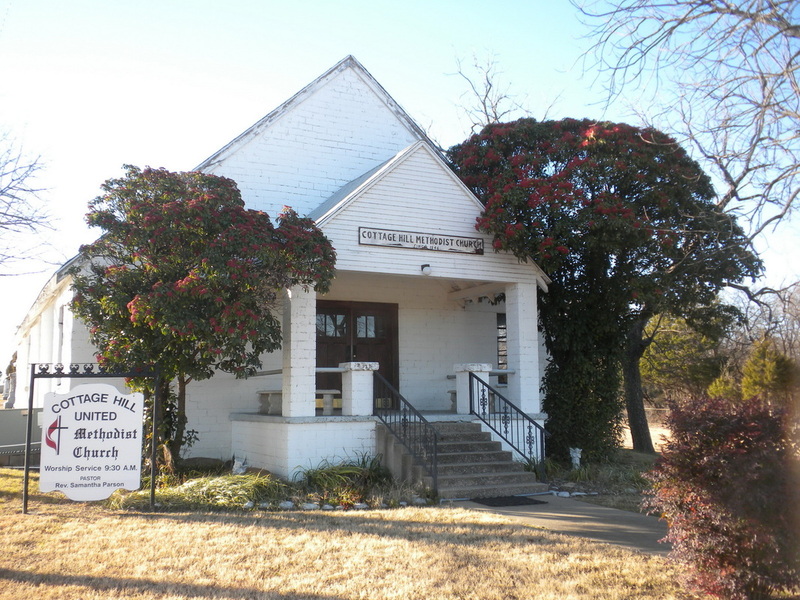 A school known as Possum Trot, located about one mile northwest of the present site of Cottage Hill Church, had been built in 1854. It took its name from the many opossums which fed on the red and black haws that grew on Haw Branch, a tributary of Honey Creek. In 1859 six yokes of oxen were used to move the building to land owned by the Reverend Marshall. Several cottages were built near by and a boarding school was operated. It was called Marshall College. About 1860 the community began to be called Cottage Hill, a name suggested by the cottages around Dr. Marshall’s school. In 1889 a register of the Cottage Hill Church lists James Marshall having been pastor in 1859; J. R. Bellamy, 1860; Wm. E. Bates, 1861; Wm. Shaw, 1862; J. L. Angel, 1863-1864. F. F. Morrill had married Nancy Jane Stone, stepdaughter of Samuel Brown in 1856 and bought land from Thomas Culwell. Mrs. Morrill is listed as a church member in 1889, dating from 1854. In 1879 Mr. Morrell deeded land for a church to be built on the present site. The building was dedicated on the Saturday before the fifth Sunday in May, 1881. A card dated April 2, 1881 from Brother John Noble at Pilot Point, Denton County, Texas to F. F. Morrill said to have the church finished and to publish an appointment for himself (Reverend John Noble) and the Reverend Tom Sherwood for that date. The Reverend John Noble had lived in the community and his home had been a “preaching place.” He was a pastor of the Cottage Hill church in 1869. The church register shows that H. H. Sullivan was the pastor; Washington Eller, Henry Harrison and Wm. M. Pafford were the church trustees. Lumber for the building was hauled from McKinney and Sherman. LAND DONATED BY F. F. MORRILL AT THIS SITE IN 1881; H. H.
COTTAGE HILL CEMETERY ASSOCIATION IN 1890. TO SERVE THE COTTAGE HILL METHODIST CHURCH.